Since its 1961 debut on the fabrics scene, Sunbrella has worked tirelessly to develop and produce the world's most durable and elegant fabrics for myriad uses. From indoor armchairs and outdoor furniture to convertible boat covers and water repellant, sun-proof tops, Sunbrella is THE leader in high quality all-weather fabrics. There are a lot of competing outdoor fabric brands out there, but Sunbrella is the best - read on and see why! As pioneers of performance fabrics, Sunbrella has the experience and the resources necessary to continuously innovate and inspire the market. Their stylish and enduring products can be traced back to their beginnings creating awning fabrics: cotton was the most popular awning material in 1961, but Sunbrella was set to rattle the fabric world with a new material that could last up to ten times longer than cotton, with less maintenance and no color fading. Their patented fibers are not dyed, but use instead "color-to-the-core" technology. This means the colors of all Sunbrella fabrics are integral to the fibers themselves, rather than just superficial stains on the fabric exterior. With innovative engineering and clever new coloring methods, Sunbrella quickly became the awning industry's most desired fabric. It was not long before the material was adopted by sailors and companies in the boating industry, as Sunbrella had gained a reputation for its water-repellency as well as its fade-resisting quality. Now, just a few years later, Sunbrella is the most popular, long-lasting fabric material for outdoor wood furniture cushions as well as the number one choice for awnings and watercraft covers. The Sunbrella difference is clear. 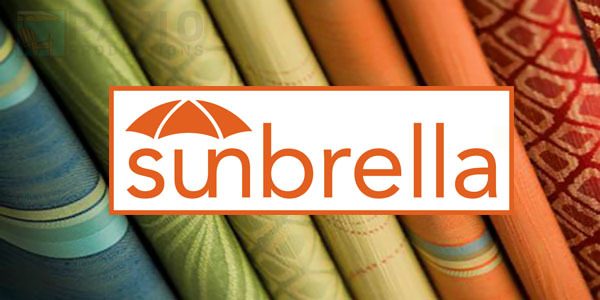 Compared to other outdoor textile brands, Sunbrella is longer lasting, is easier to clean and maintain, is better at enduring sun and weather damage, is scratch and cut resistant, and offers more choices when it comes to colors and designs. Sunbrella fabrics come in many different styles or "grades", each with their own unique weights and functions, but they all share in common an enviable longevity that puts most other fabrics to shame. The fabric is quite tear resistant and is intended for active outdoor use. It holds up to all manner of inclement weather, rain or shine or sleet or snow, and Sunbrella's resistance to color fading is legendary in the industry: because the colors in every piece of Sunbrella fabric are "color saturated," even when the outermost color layers are damaged by sunlight, the true colors of the fiber will continue to show throughout. You never have to worry about your Sunbrella fabrics fading out of style! This also means Sunbrella fabric is highly scratch-resistant. If yous scratch the fabric, it doesn't show any "white textile" underneath. The colors and patterns are not a dye; they are the material itself. So if you have blue Sunbrella textile, and you cut into it, you just see blue fabric all the way through. This makes it really easy to hide any scratches that may occur, but the fabric itself is tougher than most indoor fabrics, and resists small surface scratches with ease. Sunbrella is meticulously crafted for a typical lifespan of up to 10 years, which is more than twice as long as most other outdoor fabrics from other manufacturers. This means it will keep your patio furniture sets looking brilliant long past the typical expiration date of most consumer-grade fabrics. In other words, an investment in Sunbrella fabrics is an investment in the longevity of quality of your outdoor furniture, and your outdoor living experience as a whole! Brush off the fabric to remove any loose dirt, sand, salts, etc. Prepare a simple solution of warm water and mild soap, like dish soap, diluted. Using a soft-bristle brush, lightly apply the soap solution and clean the fabric. Give the soap solution a little time to soak into the fabric. Rinse thoroughly to remove soap residue; consider removing the cushion cover and hosing it down. That's it! It couldn't be simpler to care for your Sunbrella fabric and keep it looking good as new for years to come. Don't worry about the fabric aging. Sunbrella is naturally extremely resistant not just to water and weather damage, but it is strongly resistant to fading, even under constant direct sunlight. So just clean your fabric periodically, and it will last you a lifetime. Sunbrella fabric is remarkably eco-friendly, unlike so many other fabrics in the industry. Even in its humble beginnings, Sunbrella has been a company committed to environmental stewardship, far surpassing industry expectations with their conservation efforts and sustainable manufacturing. The fabric itself is produced in accordance with manufacturing best practices for efficiency and minimal environmental impact. And significantly, there is no water wasted in the color-saturation process. This coloring process, unique in the industry, drastically reduces water consumption and energy consumption all while avoiding the devastating effluents with which traditional dying processes are commonly associated. Sunbrella goes even further in its green mission, however, with its own proprietary recycling and re-purposing program. "Recycle My Sunbrella" reclaims pre-consumer waste associated with the manufacturing of Sunbrella fabrics, as well as post-consumer waste once a piece of Sunbrella fabric has outlived its usefulness. These are re-purposed into a variety of recycled products, including but not limited to future Sunbrella items. Sunbrella fabrics are available in a multitude of gorgeous colors and designs, from richly-hued solids to intricate and eye-catching multi-color patterns. Sunbrella is constantly updating their catalog of appealing designs to guarantee consumers the perfect accent for their quality patio furniture. Many of the patterns themselves are created by top-tier artists and designers like Joe Ruggiero and Richard Frinier. The driving mantra behind Sunbrella's manufacturing process is "Design + Performance." While world's-best performance is obviously what sets Sunbrella apart from other outdoor-grade textile brands, the fact that they put the word "Design" first in their mission statement should tell you something. These high quality fabrics are created to be absolutely beautiful and visually powerful, first and foremost. That is why Sunbrella releases all new patterns, in partnership with the world's best designers and artists, year after year. They are always innovating and moving forward for the betterment of design. While we obviously love Sunbrella for their outdoor furniture-grade cushion and pillow fabrics, they also offer beautifully-crafted textiles for a variety of other indoor and outdoor applications: upholstery, umbrella shades and sails, drapery, window treatments, and marine canvases and boat covers. Currently, the Sunbrella catalog features over 400 unique fabric patterns for outdoor and marine use. That's a lot of options! You are sure to find something that is perfect for your needs. You can customize your patio furniture even further by adding a welting fabric to your cushions that differs from the cushion fabric. Feel free to contact our sales team on the "Contact Us" page for some examples and ideas. Perhaps the best quality of these gorgeous fabrics is that they are completely worry-free! You don't need to be concerned about drinking wine while lounging in your Sunbrella-fitted outdoor sofa set, nor should you fret if your kids sit down in a patio dining set after playing in the mud: Sunbrella fabrics are stain-proof, due to the same characteristics that make them water-resistant and weatherproof. Grass stains, mud stains, bllod stains, coffee stains - you name it, Sunbrella blocks it! Cleaning the textile is a breeze as well, requiring just a simple wipe-down with a wet non-abrasive cloth or towel. 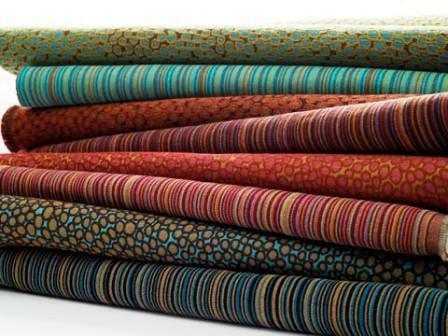 Sunbrella Fabrics are available in a multitude of styles - Click to view! We promise you, nothing makes your outdoor wood furniture look as good or last as long as high quality Sunbrella fabric. That is why at Patio Productions we are proud to offer more outdoor furniture sets fitted with customizable Sunbrella fabrics than anyone else on the internet! We know you have a lot of shopping choices when you look for patio furniture online; we hope you will choose Patio Productions, featuring Sunbrella fabrics, and get the best furniture possible for your own backyard!